WASHINGTON -- Hillary Clinton's presidential campaign is launching a major grassroots organizing effort Wednesday, sending staffers to every single state to start building an infrastructure of volunteers ready to pound the pavement. What's being called the "Ramp Up Grassroots Organizing Program" will have paid staffers in all 50 states, the District of Columbia and the territories through the end of May. They'll be working with Clinton supporters to organize local meetings, volunteer trainings and other grassroots events, according to the campaign. Wednesday's announcement recalls the "50-state strategy" pushed by former Vermont Gov. Howard Dean when he was chair of the Democratic National Committee from 2005 to 2009. Dean argued that Democrats shouldn't concede any state as "unwinnable" and should invest resources in building an infrastructure in every single state -- a strategy Clinton will be testing should she make it to the general election. Since jumping into the race, Clinton has focused on smaller, more intimate events, meeting with students at a rural community college in Iowa, for example, and spotlighting a message of middle-class economics. Next month, however, she'll have a larger rally, and these state teams will organize house parties for people to watch the kick-off. The campaign is also sending an email to supporters Wednesday with a video featuring Marlon Marshall, Clinton's director of state campaigns. "Organizing is the heart and soul of this campaign," says Marshall in the video. "As we speak, things are ramping up in all 50 states and the territories. Face-to-face conversations with your friends and neighbors are how we will win. So we're doubling down on old-school organizing." Although Clinton is so far the only major candidate in the Democratic field, aides have been insisting that they are preparing for a competitive primary contest in an effort to avoid the perception from Clinton's 2008 campaign that she expected to easily become the Democratic nominee. 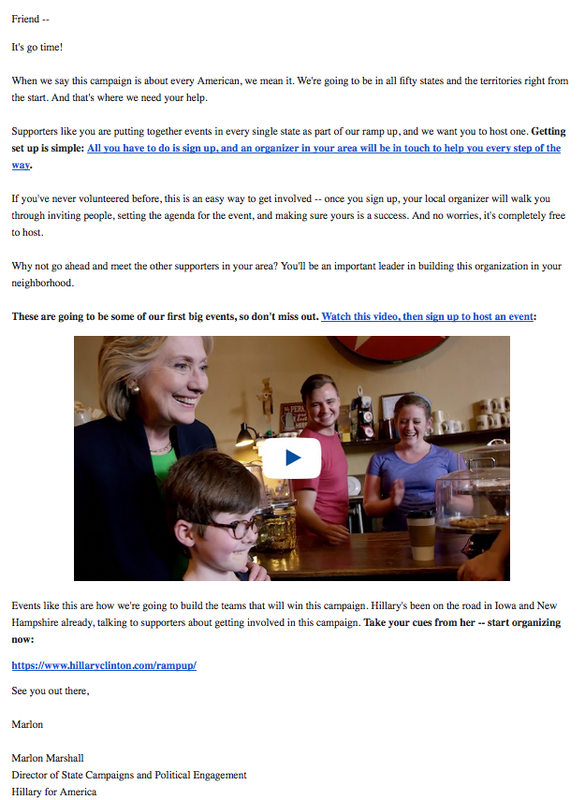 Clinton's team recently launched a "Hillstarters" fundraising program where donors are asked to raise $2,700 -- the maximum an individual can give during a primary season -- from 10 people. In return, Hillstarters will get an invitation to a summit with Clinton next month. The campaign also said this grassroots organizing program is part of its effort to ensure that they "will be ready to compete and win the primary or caucus" in every state.